Draft document on ‘Mushroom Mission ‘being released at the first ever Mushroom festival. Meghalaya is now aiming to increase mushroom production many folds from a meager 27 metric to an astound 5000 metric tons within five years. 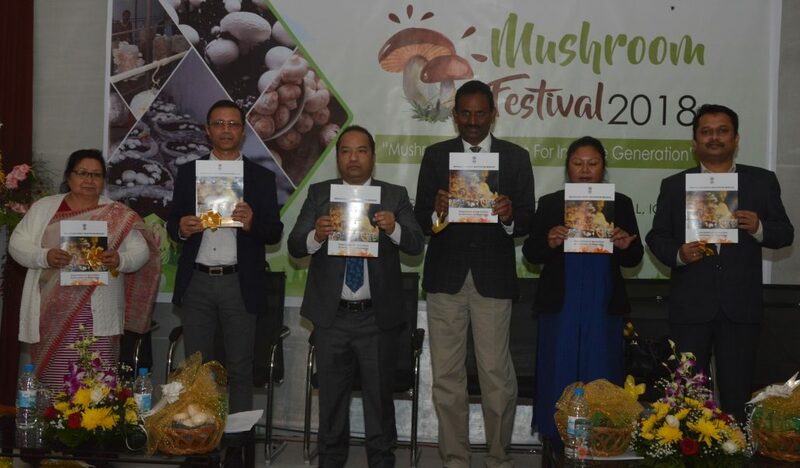 The Meghalaya government is setting this target as it released a draft document on ‘Mushroom Mission’ at the first ever Mushroom festival themed “Mushroom cultivation for income generation” at All Saints’ Hall here on Monday. The aim of the festival was to create awareness about mushroom cultivation as an alternate income generating activity as well as an activity that can be integrated into the farm business to enhance farm income. The draft Meghalaya Mushroom Mission was launched by Meghalaya Agriculture Minister Banteidor Lyngdoh in the presence of agriculture officials. The mission will focus mainly on the production of Oyster Mushroom, Button Mushroom and Shiitake Mushroom. The government will invest Rs 50 crore for a period of five years and funds for the mission would be sourced from a number of funding agencies such as Mission for Integrated Development of Horticulture of the Central government, Megh-LAMP and the German Development Bank KfW. The mission will cover 136 villages in mushroom cultivation in all districts of the state. The main objectives of the Mission is to scale up mushroom production in the State through a cluster approach, diversify the dietary patterns of the state so that nutrition and health of the citizens is improved, focus on value addition of mushroom and mushroom products for improved economic gain, upgrade existing production centres for provision of various services to farmers and build the skill base and capacities of potential farmers through capacity building programme. “The target to be achieved under the Mission is to increase mushroom production from the present 27 metric tons to 5000 metric tons within five years,” the minister said. Meghalaya additional chief secretary and agriculture production commissioner K N Kumar informed that with just about 15 per cent of the geographical area under cultivation, growing mushrooms and marketing them is a lucrative option available to the people. Kumar said that mushroom cultivation has the potential to address the nutritional concerns of the state in terms of protein, and vitamin deficiencies.